We’ve said it before, and we’ll say it again: humanity is living in the golden age of rideable technology right now. Over the past few years, electric motors have become smaller and more powerful, while batteries have become more power dense and accessible — two trends that have coalesced and kicked off a renaissance in personal transportation devices. There are almost too many rideables to keep track of anymore, and they seem to get crazier and more advanced with each passing month. So, to help you navigate the increasingly crowded marketplace, we’ve put together this list of the best electric skateboards you can buy right now. Enjoy! 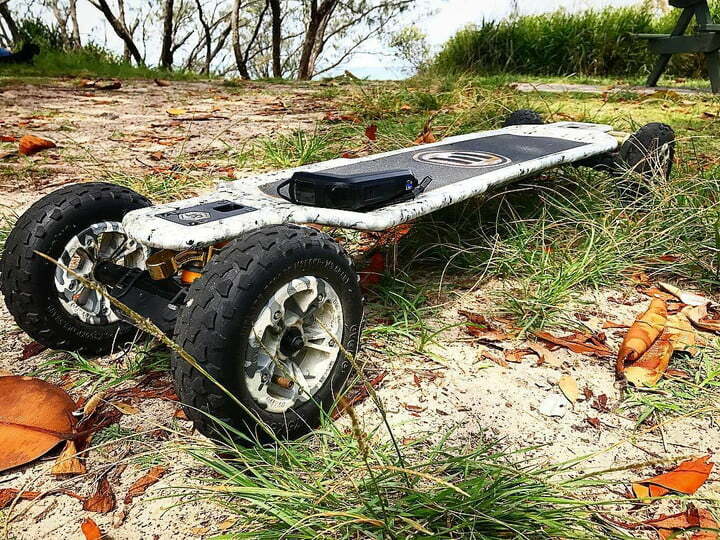 Why you should buy this electric skateboard: The Inboard M1 is the best electric skateboard currently available. Who it’s for? Avid skaters looking to incorporate a welcome electric assist to their daily grind. Inboard claims that every detail of the M1 is based on the idea of uninhibited flow. This essentially translates to a fluid and responsive ride, one that utilizes two hub motors in the rear wheels instead of your stereotypical gear system or belt-drive. Because of this, you can utilize the M1 like a traditional skateboard without ever having to turn on the motor. 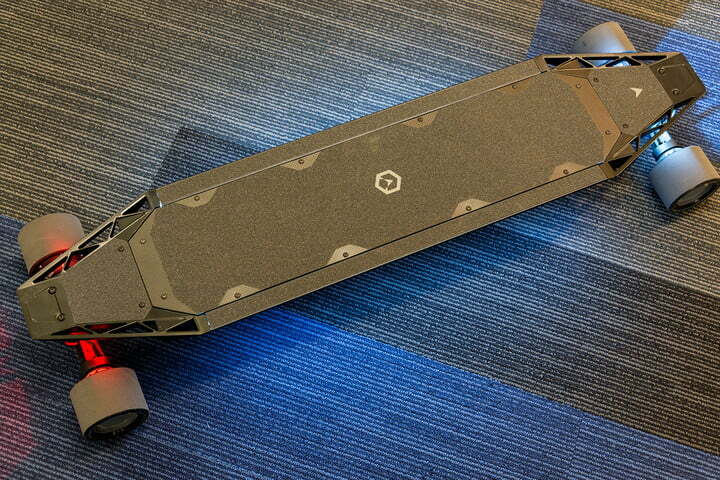 Other hallmarks include the board’s sleek, 14-pound figure and swappable battery system — a feature that means you can jump from one 90-minute session to the next within seconds. The board’s innate Bluetooth connectivity, 10-mile range, and regenerative braking — a convenient feature that feeds energy back to the battery for extended life — just help to further justify the lofty price tag. 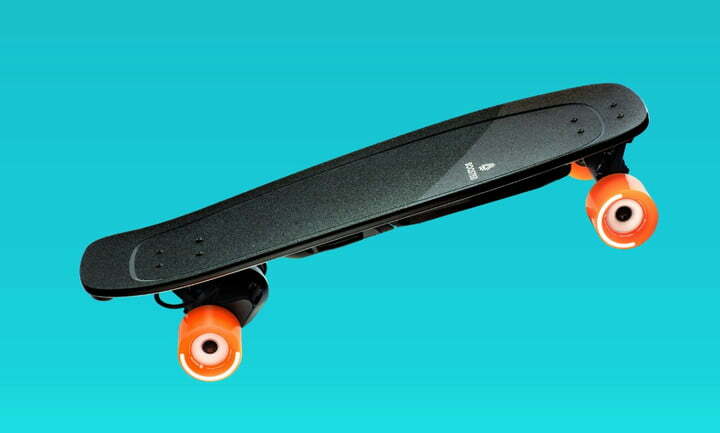 Boosted makes some of the best electric longboards in the biz, and the Mini is no exception. Despite the fact that it doesn’t boast quite as much battery life as its larger siblings, it makes up for that shortcoming with a myriad of awesome features. Our favorite? The deck. It’s got this lovely radial concave shape that provides a comfortable yet responsive platform for you to stand on, and this time boosted even gave it a kicktail. This makes it much easier to whip the board around and perform tight turns when necessary. The Mini’s deck is also considerably shorter than that of previous Boosted boards, so it’s super easy to pick up and take on a bus/train/whatever. This board also comes with Boosted’s top-notch control system, and therefore provides extremely smooth acceleration/deceleration while you ride. On cheaper boards, acceleration and braking is either to fast and jarring, or too mellow and sluggish — but Boosted boards strike a perfect balance. The Mini feels powerful yet controlled under your feet, allowing you to ride confidently no matter what your skill level. This board is absolutely ideal for commuters. Why you should buy this electric skateboard: You’ll be hard-pressed to find a more powerful electric skateboard. Who it’s for? Speed junkies, thrill seekers, and people who live in hilly neighborhoods. Electric skateboards come in just about every shape, size and configuration at this point, but as far as we can tell, Acton’s Blink QU4TRO is the only one on the market that boasts four hub motors. For those of you keeping score at home, that’s one for each wheel — which is absolutely bonkers. With that many motors, this board boasts the most torque, power, and speed of any electric board we’ve ever ridden. It tops out at 23 miles per hour, can travel 22 miles on a single charge, and can climb hills with up to a 30 percent grade. The only downside? It also weighs a ton. It takes a lot of battery power to drive all those motors, and power-dense lithium ion batteries aren’t exactly lightweight. As such, theQU4TRO tips the scales at a whopping 25 pounds — so it’s a bit of a pain to carry around when you’re not riding. This extra weight also means it isn’t quite as playful and easy to maneuver as a smaller board might be. You can’t really pop the nose up or whip the board around to make tight turns. Luckily, Acton built in a sweet new suspension system that helps compensate for that. Why you should buy this electric skateboard: The Onewheel+ is one of the most enjoyable electric rigs we’ve ever tested. Who it’s for? Anyone looking for something different in a market brimming with traditional electric skateboards. We checked out the original Onewheel a few years back, and recently got a chance to rip the new-and-improved version around PDX — and although it isn’t what you’d typically consider a traditional skateboard, it’s still one of our favorite rideable gizmos of all time. In fact, the futuristic device functions more like a snowboard or surfboard than it does its four-wheel counterpart. 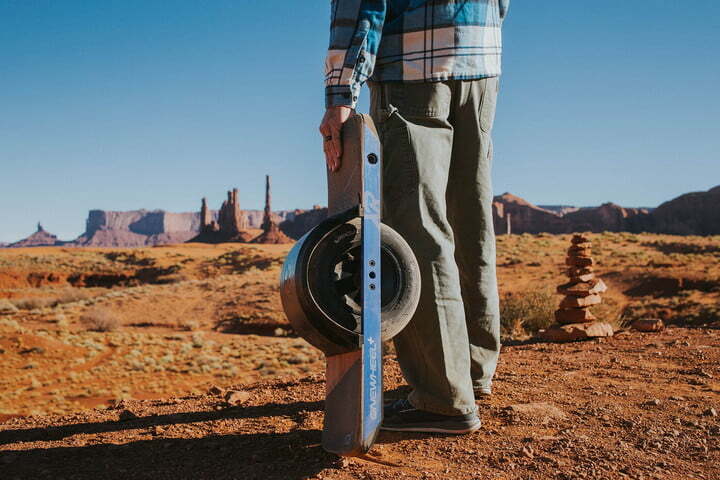 The 2-horsepower deck is essentially made up of up split platform and a lone all-terrain wheel, each of which utilize a slew of onboard motion sensors and dynamic stabilization to give better your balance and control. Simply shifting your weight allows you to propel forward or back, and because of the ruggedness of the central tire, you can forge your own path just as easily on grass-lined hills as on sidewalks. The board’s 7-mile range and top speed of 15 mph merely comes second to the software, given the latter lets you to adjust how the sensors, gyros, and motor work in tangent with one another. Want to go faster? There’s an app for that. 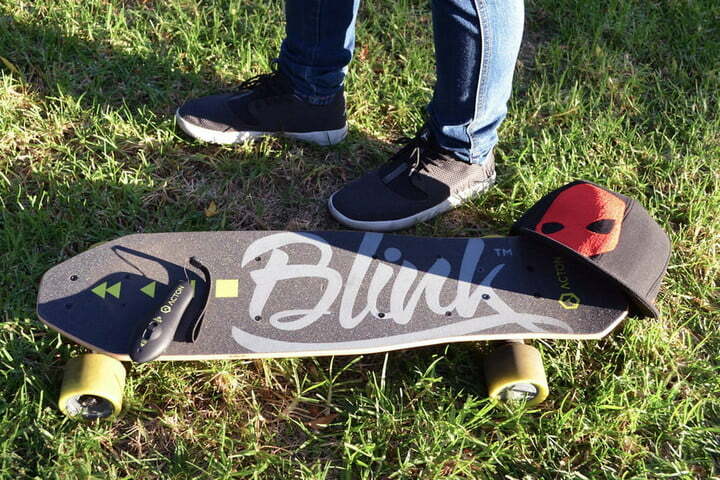 Why you should buy this electric skateboard: The Blink Lite is the best budget electric skateboards out there. Who it’s for? Those looking to test the electric skateboard waters without going all in on a high-end model. 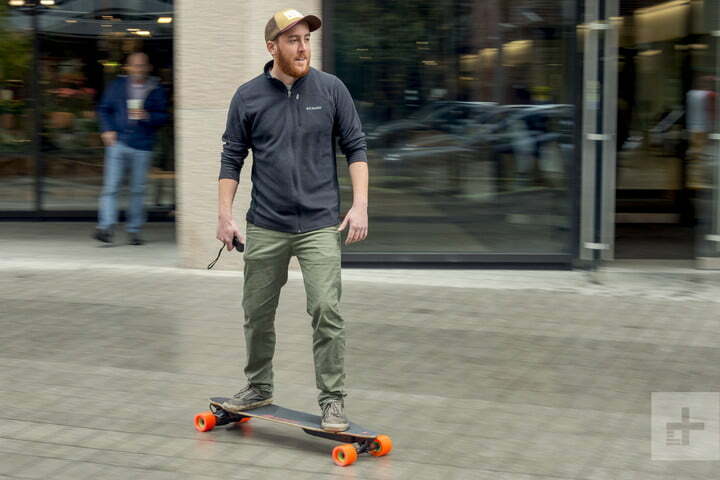 While frequent skaters may prefer to invest in a premium electric skateboard, folks who use their board less often or primarily on the weekends may want to start with a budget option. The Blink Lite, for example, is a lot less expensive than many of the others on this list — which is perfect for someone looking for a more casual way to get around town. Weighing just 7.7 pounds, this sucker is one of the lightest electric skateboards on the market right now. It’s maximum power output is just over half of the larger Blink S2 board, but its range is just 1.5 miles short, standing at 5 miles. One of the neater features is actually off the board — Acton allows its Blink Board users to connect to the Acton app to log miles, record routes, and document adventures. You can even participate in challenges against other riders. Just don’t expect to rip this little guy up any big hills. It just doesn’t have the oomph to make it happen! Why you should buy this electric skateboard: Boosted’s flagship board offers one of the smoothest, most polished riding experiences in the biz. In addition to Boosted’s fantastic handheld throttle mechanism, the board’s motors are exquisitely well-tuned — so much so that we dare say they offer the smoothest acceleration and deceleration of any electric board we’ve ever ridden. On most boards, you’ll experience a bit of a jarring effect when you hit the throttle or brakes, no matter how hard or soft you try to accelerate. This is especially pronounced when starting from a dead stop. More often than not, the average board will speed up too quickly for your muscles to adjust, thereby throwing you off balance — but we experienced no such effect with the Boosted 2 Dual+. Bringing yourself to a gentle stop doesn’t require an ultra-delicate touch on the decelerator. You can actually mash the brakes fairly hard without flying off the front of your board, because the motors slow you down in a gradual (but still strong) way. As an added bonus, the board’s software can be tuned to suit different users. If you’re a beginner, you can limit the board to a top speed of 11 mph, and make acceleration/deceleration even more gradual than it usually is. If you want a bit more speed, but don’t want to eat up all your battery power, just put the board in Eco mode; it’ll top out at 16 mph, but leave you enough oomph to power up moderately-sized hills. And if you’re a real ripper, you can kick the board into either Pro or Expert modes — both of which will get you up to (or over) 20 miles per hour. Toggling between these modes is as easy as pressing a button on the controller. Generally speaking, longboards and skateboards don’t fare very well on less-than-ideal pavement. Smooth sidewalks and brick promenades are one thing — but as soon as you hit cobblestone, cracked pavement, or gravel; you’re screwed. This is especially bothersome if (like us) your commute is a mixture of both. The Carbon GT 2-in-1 is Evolve’s attempt to fix this problem. It’s equipped with a swappable wheel system, which allows you to switch between standard urethane wheels and big, beefy all-terrain tires in just a couple minutes. The standard setup is top-notch and would make the list even without the swapping system — but Evolve’s off-road wheels are nothing short of fantastic. They allow the board to tromp over just about anything — gravel driveways, small potholes, and even muddy patches of grass. This makes it feel far more free and dynamic than a traditional longboard, since you don’t have to hop off and hoof it when the going gets tough. Instead, you can just bend your knees and charge through.